A lovely, young woman, accustomed to living in her father's shadow and a wounded warrior, seeking forgiveness are brought together by fate in a small town in the Texas Hill Country...Henrietta Davis wants to please her father. It's no secret Henry Davis had hoped for a son who would one day assume his position as president of Davis Bank and Trust, so after graduating from college, Etta returns to her home in Burnet, Texas to work as her father's unpaid assistant. But try as she might, she cannot live up to her father's expectations. It's 1919, and a woman can't become president of a bank.But then tragedy befalls. Uncertain and grief-stricken, Henrietta Davis must find the courage to take over her father's position as bank president and find the embezzler who is slowly ruining her family's business and good name. Lieutenant Gabriel Benson returns to his hometown after fighting in France. Besieged by memories of the battlefield and unable to adjust to the quiet life of Burnet, Texas, he wonders if he will ever be able to forgive himself for leading his men to their deaths.Gabriel and Etta have no one to confide in except each other, and as their friendship grows, so does their love for each other. But their love won't survive unless each conquers the demons that threaten to keep them apart. After many years of writing and publishing in the nonfiction world of academia, Claire Sanders turned her energy, humor and creativity towards the production of compelling romantic fiction. 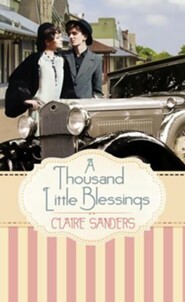 Claire writes captivating stories that fit the genres of contemporary, historical, and inspirational romance. Claire creates heroes any woman would want to be with and heroines who overcome all obstacles to find love. Written with wit and tenderness, her stories engage the readers' hearts and imaginations. Readers will find themselves anxiously turning the pages to find out what happens next. Claire lives in the greater Houston area with her daughter and one well-loved dog. When she isn't writing, you'll find her cooking, gardening, and dreaming of places to travel. 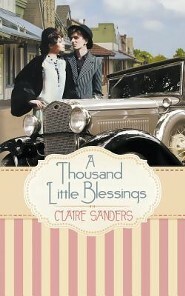 I'm the author/artist and I want to review A Thousand Little Blessings - eBook.